When you are getting ready to decorate a bedroom, the first thing you do is look for inspiration. 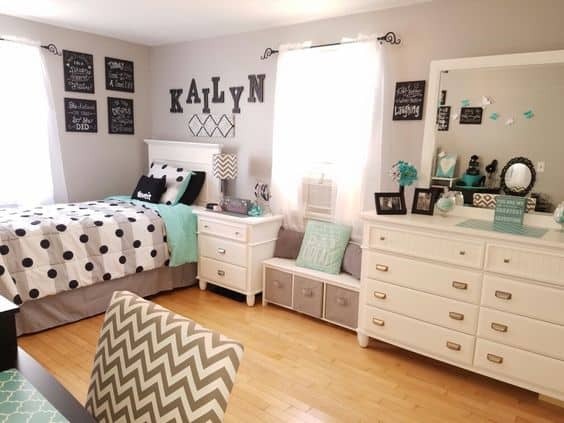 But there are so many adorable girl bedroom ideas it’s overwhelming and sometimes even stressful to sort through them all. What if I told you there is a way to look at bedroom decorating ideas and not go crazy in the process? 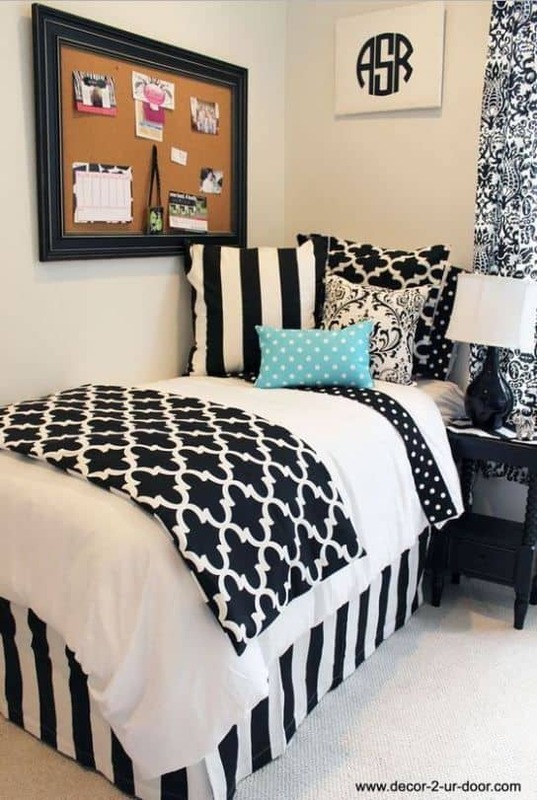 I browsed Pinterest for you and chose the very best girl bedroom ideas anybody can re-create. Easy, no? 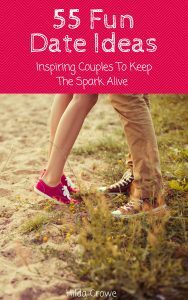 This blog is for real moms, offering real help, so what’s the use of a collection of pictures that nobody can afford to copy? I am not a fan of too much stuff that just collects dust and accumulates, I focus on a few interesting pieces instead and try to make sure the overall atmosphere of the room is inviting. 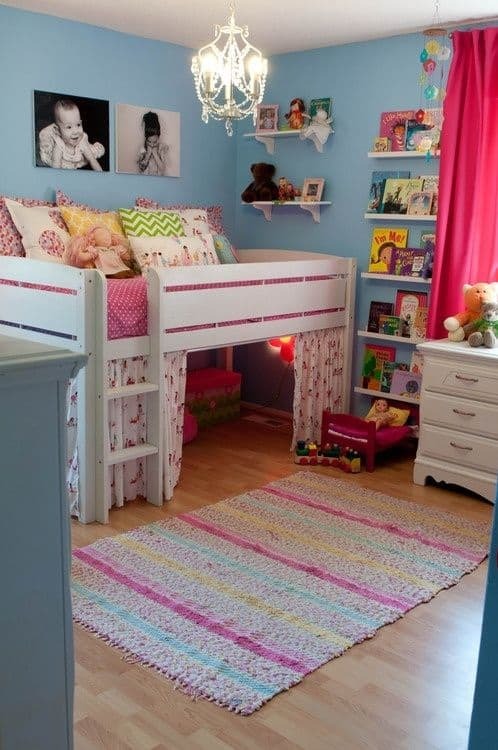 I am planning to move my 7-year-old in her own room in the near future (right now she is sharing with the boys), so this post is in part inspired by my own search for girl bedroom ideas. 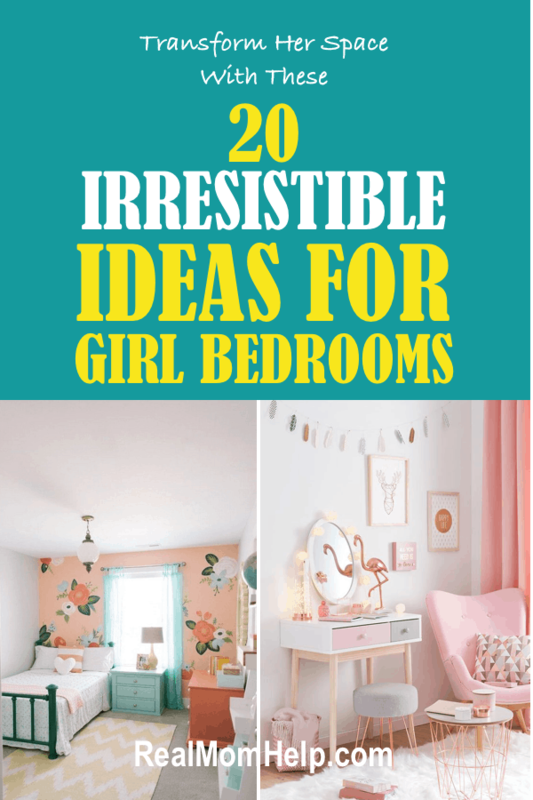 If you are also looking for irresistible girl bedroom ideas that are also perfectly realistic, this list is for you! 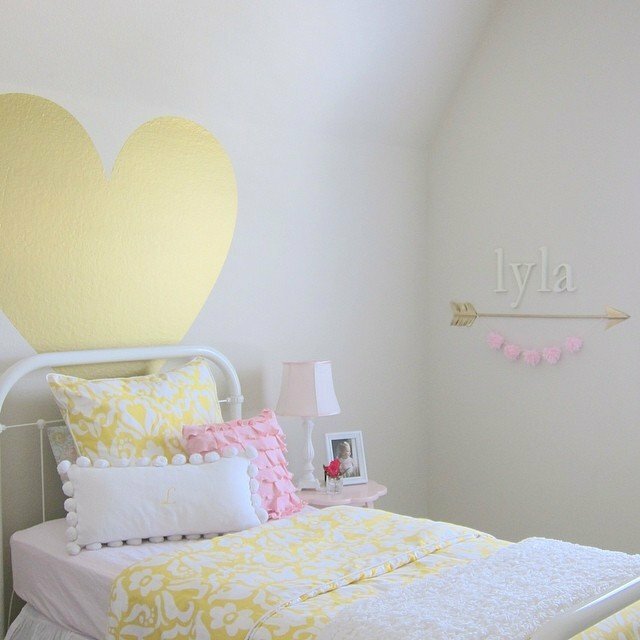 I love how the pastel pink and yellow accent pieces add color to a fresh, white bedroom. I would wanna sleep in this bed for sure! 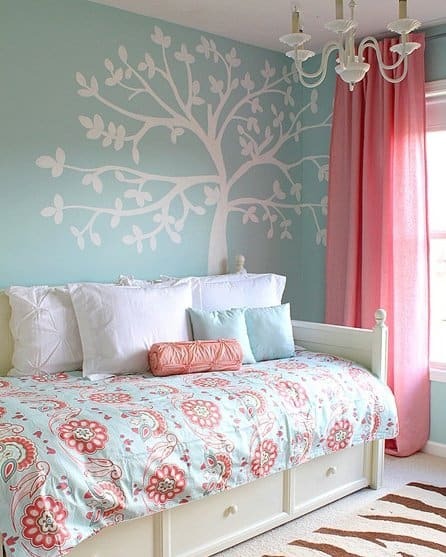 How cute is this room? I have never met a little girl who isn’t on Cloud 9 when eating ice cream, doughnuts, and cupcakes. The whole bedroom has a happy and sweet feel to it. This bedding set is pretty similar to the one on the picture. I admit I couldn’t possibly stand buying that many knick-knacks, so I would fill this shelf up with books instead. 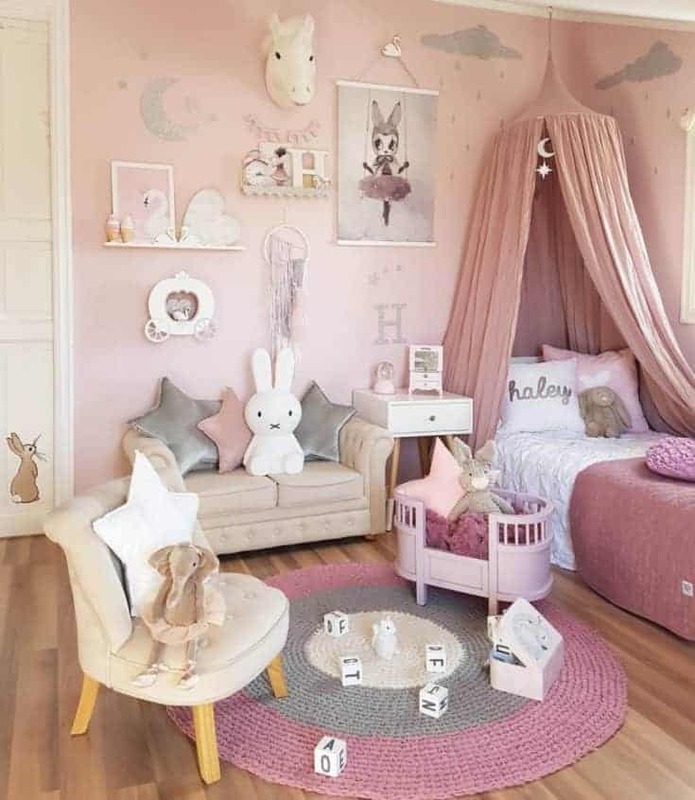 This bedroom is for a little free-spirited girl, who dabbles in many different hobbies, enjoys the calmness of neutrals and girly enough to like different shades of pinks. 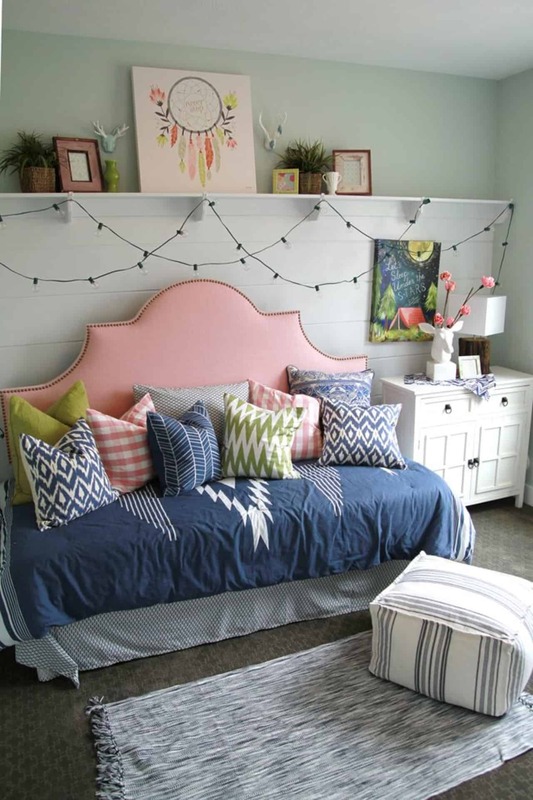 Okay, this is what I want my bedroom to look like, I am a turquoise fanatic. Image credit: Ryan Scott 2 Go. If somebody told me they were painting a dark brown access wall in a girl’s bedroom, I would have been like, “uhm, I hope you won’t hate it”. But it totally works here! By keeping everything else white, and adding just enough pop of hot pink, I really love how this room turned out. Lilac, white and green have long been my favorite combination, and this room is simply stunning. 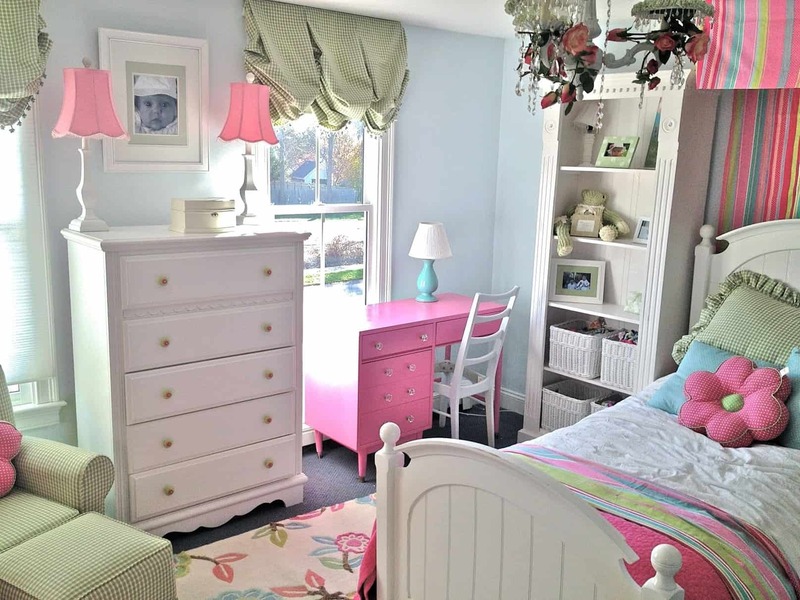 I imagine this room for a pre-teen or teen girl, who outgrew the pink and purple “little girl” colors and is ready for something more grown-up like. However, the cute turquoise accent pillow adds just the right amount of playfulness and I love the pattern mixing too. Pink and green gingham? I am thinking little cozy country cottage. I really love the idea of a daybed instead of a regular bed, because it doubles as a couch. Check out the strings of lights and the awesome, long shelf! Tissue pom poms are all the rage. They are kind of a pain to put together though, but the look is really cute. Did you notice that the bed is grey and the lamp-shades coordinate with it? Yellow and lilac and hot pink accent colors make this otherwise neutral room far from boring. Not sure if I was ever brave enough to buy a yellow bedframe, So I would either add a yellow rug or yellow curtains instead. Image credit: Walls Need Love. Gold polka dots on the wall? Fancy! A few interesting accent pieces make this room even more put-together, ready for a neat little lady. 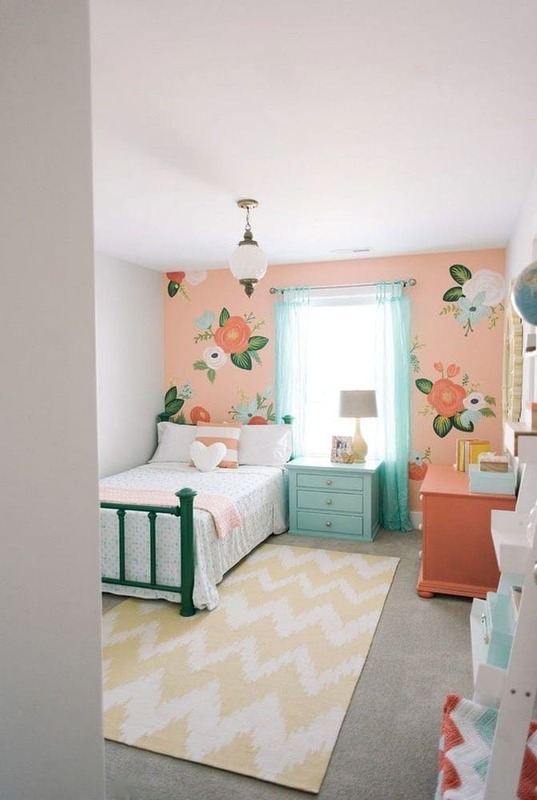 This one is a perfect room for a little girl who loves to read in peace and quiet. I am a huge fan of loft beds because they utilize that huge amount of space in a room we otherwise couldn’t use. Loft beds are very functional for tiny bedrooms too. 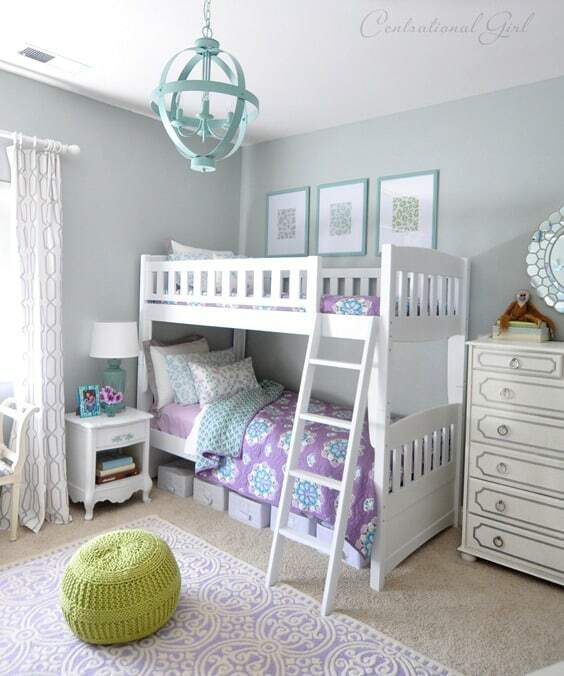 As her future room is pretty small, we are definitely going with a loft bed for my daughter. IKEA has great ones. In my mind, this is the type of room the princess took the frog up to sleep. 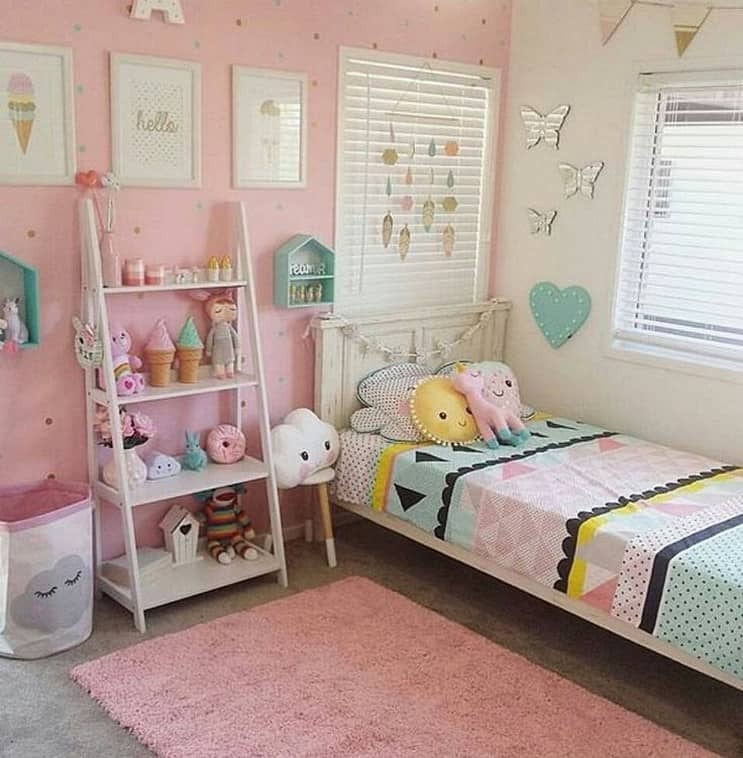 While your little girl will hopefully not have to deal with those gross creatures, the room is a perfect fit if you wanna go full pink and prissy. 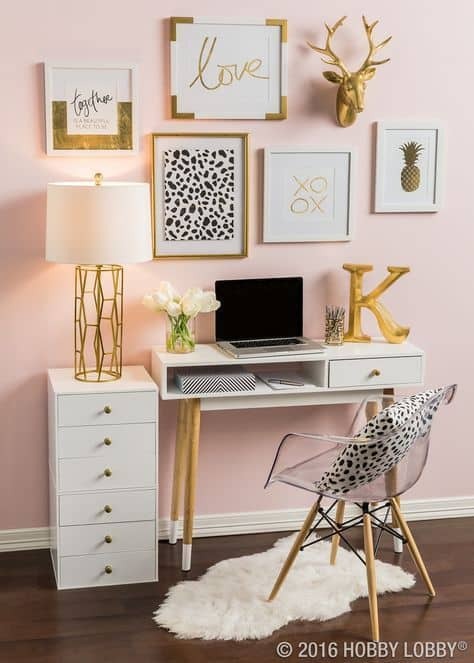 Another room that may be more appealing to the older girls, I love how chic the leopard, gold, and white look together. This room was love at first sight. The bedding and the standing lamp are everything. I already mentioned my love for daybeds, and here is another fave of mine: wall decals. With the never-ending choices out there, it is so easy to get a huge bang for your buck and transform a boring wall into a perfect focal point. I love this room so much because of all the different patterns and my favorite color, teal showing up as an accent. 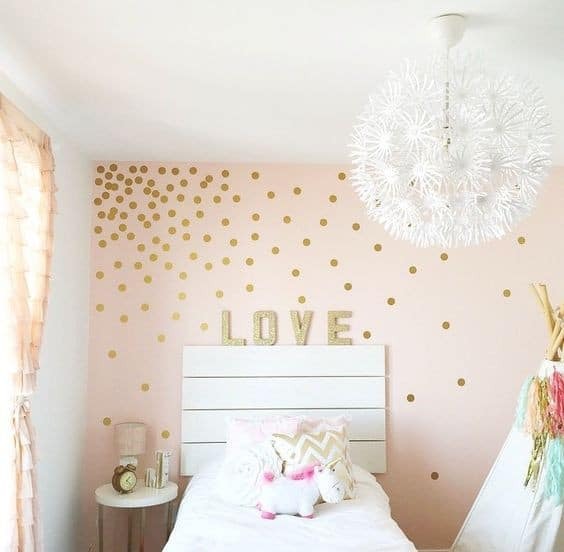 While this looks more like a teenage bedroom, it could be altered to suit a younger girl by changing the accents and wall decor a little bit. Then the room can grow with your child, which is my absolute first criteria when I choose decorations. If I walked into a bedroom like this every day, I would think of summer, ocean, warm breeze and peaches all day. I am determined to persuade my daughter to choose this color palette. That fluffy rug. The comfy chair. And my favorite neutral, grey. 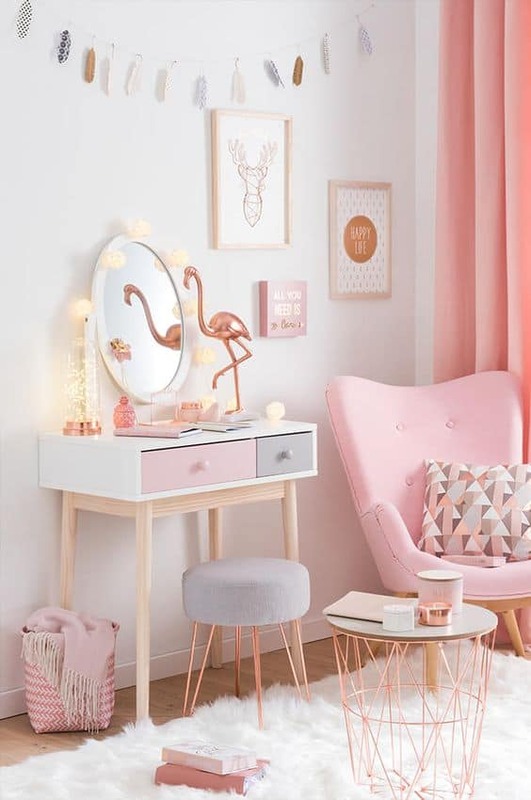 I think any teen girl would happily do their homework in a chic room like that. Okay, maybe I shouldn’t go that far. I hope you loved looking at these inspiring bedroom ideas and walk away from this post with a plan in your head.